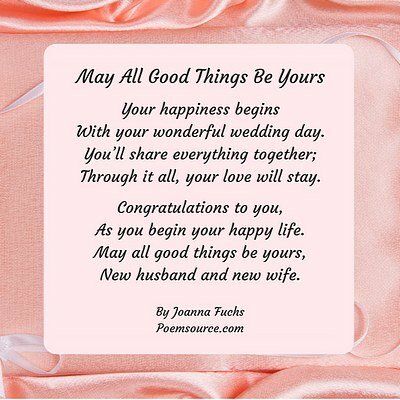 Free wedding poems wishes and messages for greeting card sayings, wedding invitations, favors, programs and thank yous. Wedding toasts, vows, a father daughter dance song, a wedding vows renewal poem, a marriage blessing and a wedding prayer or blessing. Wedding poems often talk about a happy start to a lifetime of happiness, as this wedding poem does. As wedding wishes go, this is a very warm and sweet one. This wedding poetry is designed as a greeting card message. It's a wedding poem, in free verse, that hints at how important a good marriage is to a happy life. the deepest and best of pleasures. and strengthens both husband and wife. be all that you dream of and more. Here's a perfect wedding poem for a "Congratulations on your marriage" card. A wedding is about new beginnings, and wedding poems reflect that. This wedding poem talks about the beginning and the continuation of wedding love. Wedding poetry, especially a wedding rhyme, makes your contribution to the wedding very special. This wedding poem could be a wedding toast poem, a wedding day poem or a wedding card poem. You can also use it with a wedding gift as a wedding wish. Wedding poems can rhyme or be written in free verse, as this one is. It's designed as a greeting card message. It’s a wedding verse sure to warm the hearts of the happy couple. Wedding poetry designed as a greeting card saying expresses good wishes for the new couple, as this wedding verse does. It's a rhyming poem. Wedding poetry should focus on the joy of the wedding day and on the happy future of the bride and groom, as this free verse wedding poem does. Attendance at a wedding requires an invitation! Wedding invitation poems have to be short to fit on invitations. Here's a wedding poem that's also a wedding invitation verse. Here's another wedding invitation verse. Wedding poems are used on thank you notes and on wedding programs. This wedding poem could be used as a wedding thank you poem (distributed at the reception) or as a poem for a wedding program, or even as a wedding favor poem. Some wedding poems can be used as wedding vows. Here is a free verse wedding vow for the bride that could also be used as a wedding poem. You’re my hero, my defender, my soul mate, my love. Some wedding poems can be used as wedding vows. Here is a wedding vow, in the form of a free verse wedding poem, for the groom. These free verse wedding poems can be used as shorter wedding vows. (Man's name), I’ve dreamed of the man I’d want to be with forever: strong, smart, kind, tender, romantic. You’re better than I dreamed. When I’m with you, my heart glows with pleasure, and I wonder how I could be so blessed. I was born for you. Let me be your friend, your playmate, your biggest fan. I offer you my heart, my mind, my life. (Woman's name), I always knew the kind of woman I wanted: bright, attractive, fun-loving, affectionate. You’re all that and more. When we’re together, I’m happier than I’ve ever been before. You bring out the best in me. You’re so easy to love, and no one can love you like I do. Let me be your hero, your lover, your greatest admirer. I offer you myself, my love, my life. 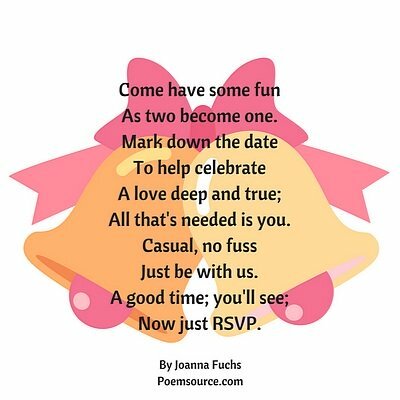 Free verse wedding poems can be used as wedding toasts. Such wedding toasts should touch and entertain the wedding guests as well as the wedding couple, as this poem tries to do. Here's another free verse wedding poem designed as a wedding toast. It's designed to lift up the bride and groom and also make the guests happy. the perfect partner for life's adventure. This father daughter dance lyric I wrote is to the tune of the song When Irish Eyes Are Smiling, which I believe is in the public domain, but you should check for yourself before performing the song. The sheet music for this song should is easy to find on the Internet. Be careful, though, that the arrangement, that is, the harmony parts and accompaniment, are not copyrighted. If they are, you can seek permission to use the arrangement. Here's a bonus: This melody is written in waltz time, so if you want to do a waltz with father, you can. Or, if he doesn't dance, you can just sway back and forth. I am really surprised at the very large number of people who are looking to renew their wedding vows. Wedding vows renewal is a very hot topic, so I wrote the free verse poem for those many people who are interested in renewing their wedding vows. I still feel for you. I really know you, and I really love you. happily bound together by a united, everlasting love. My dreams came true when I met you. a magic door to the very best life has to offer. beautiful tomorrows filled with even more happiness. that I will love you forever. Wedding poetry can give advice, as this wedding poem does. It's not a rhyming poem, but more and more people are seeking free verse. Wedding wishes and wedding messages sometimes have a religious theme. This wedding poem is a wedding prayer. Sometimes it’s called a wedding blessing. Dear Lord, please bless this man and this woman as they enter into a commitment to spend the rest of their lives together in harmony and happiness. We pray you will bathe them in bliss, the indescribable happiness that comes from finding one’s true soul mate and life partner. We pray you will guide them through life's exciting adventure and lead them to fall in love with each other again and again as time passes. Not that they won’t ever disagree, Lord; they probably know that already. But we pray you will bless them with an all-encompassing, transcendent love that generates deep respect for each other. Bless them with a willingness, even eagerness to listen to each other, to put the other first, as it says in the Bible in Ephesians. Bless them with a desire to focus on each other’s good points to remember why they are together, and a wish to express affection and praise for each other often. Dear Lord, please manifest yourself in their marriage. May Your peace that passes all understanding envelop all their joys and pleasures, challenges and fears. Give them confidence in Your constant presence in their lives, that you are always there to love them, lift them up, encourage them, strengthen them. Let this be a marriage where one plus one equals more than two, as You bring them closer to each other and to You, with their love maturing and becoming more satisfying with each passing year. Bless them as they love each other, help each other, share in each other’s joys and comfort each other when life isn’t as they wish. May they always feel that You have given them more than enough and that their lives are filled to overflowing with Your blessings. Dear Lord, we pray You will direct them and gently lead them on the path You would have them take, within Your plan and purpose for them, according to Your Holy will. with You as their guiding light. The above wedding poem is not a rhyming poem, and it’s too long for a greeting card message or saying, so it would probably be read aloud at the wedding.